OExchange is a new open standard that allows third-party sharing services (such as AddThis, ShareThis, etc) to work together to send and receive content that people share online through these services. Google, Microsoft, LinkedIn, Digg, Clearspring, Echo, Instapaper, Posterous, AddToAny, PrintFriendly, Springpad, Webs and yfrog have already signed on to support the standard. 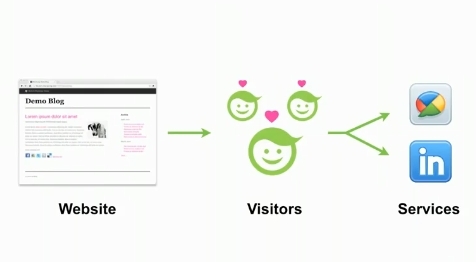 So basically, if a website has an OExchange “tool” installed on their site, and the visitor does not see a sharing service that he/she wants to use, the visitor can then with a few clicks add a service and destination that they prefer (i.e. Google Buzz, LinkedIn, etc). Sharing services are used across many kinds of websites, and there is a somewhat daunting number of them (and adding all of them to your site really crowds things up), so an open standard that makes them interoperable makes sense. Of course, a major missing partner from the list above is Facebook, which launched their Open Graph in April along with their new Like buttons.